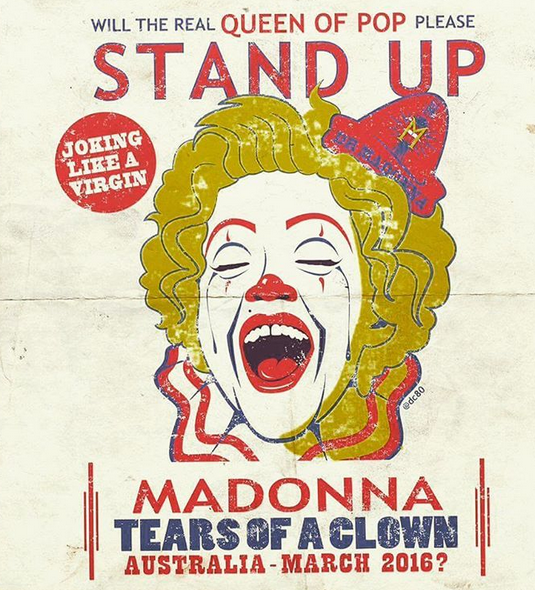 MADONNA And Tears Of A Clown – Oh Gosh, No! Do not get me wrong with this title. I adore Madonna. She has always been part of my life. Today, I was aware she has another project in hands, called “Tears Of A Clown”. What is “Tears Of A Clown”? Apparently, it is a mini show will that take place next Thursday (March 10) at Melbourne’s Forum Theatre. We can say it is a tribute from the queen to the Aussies, yes. It seems also that it will be a mixture of Stand Up Comedy, art and music. My first reaction on this is a mixed one. Above all, I admire Madonna for her courage and her endurance in testing the limits of society. Maybe the bounds she doesn’t know or doesn’t want to accept. So, I am so admiring her for this new adventure. Something that will probably be new and daring! On the other hand, I confess I am a bit scared. Will Madonna do stand-up comedy in a mini show? Yes, we know she had already done some experiences in that department. Yet, I do hate stand up comedy and I do not think Madonna has the real talent to do it. Or…maybe it is only my reaction to it, I am not sure. Adding to this, I special do not sympathise with clowns. They scare me a little and they are awful. What will OUR Madonna do when mixing stand-up comedy, clowns, art with what she does best: music? Madonna`s music mixed with all these scary contents, areas? I do not know if it will work. I do not know if I like the idea. But, whatever the result will be, I will support her. Above all, because Madonna believes. Because Madonna is a fighter and this is another example to us, to live our lives. Thank you Madonna for this. Once again.